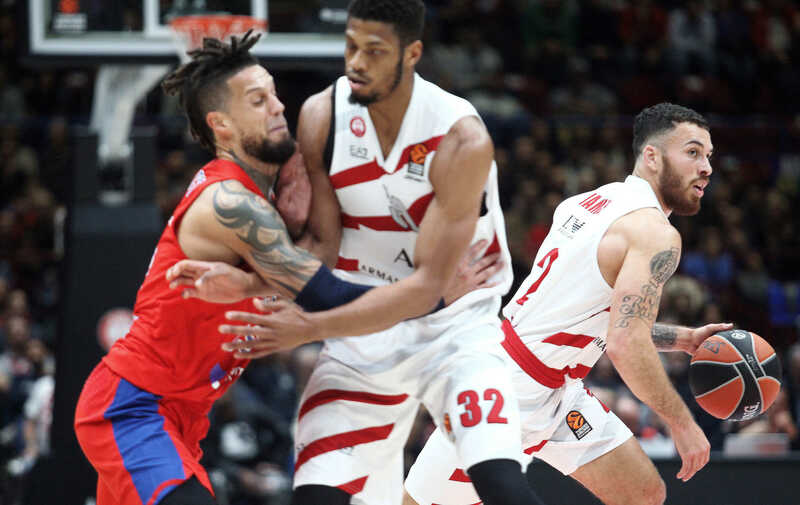 One of the top offenses in the Euroleague, Olimpia Milano excels at PNR situations no matter what type of defense it faces. Olimpia Milano had a great start to the Euroleague season with a 3-1 record (which includes a big away win against Olympiakos Piraeus) and an intermediate spot in playoff at the end of October. They have one of the most effective offenses in Euroleague and 2nd lowest rating of turnovers per game. 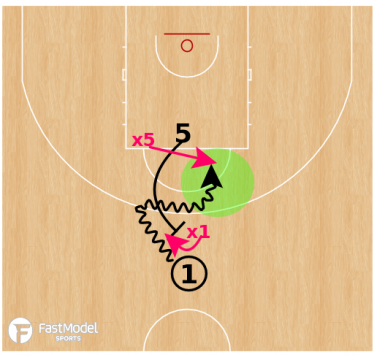 If we look at its offense, it can seem fairly basic – simple sets and lots of PNRs. But what really gives Olimpia Milano success (and points) on offense is how it executes PNRs at such a high level. Here I have provided an overview of some of the common concepts that head coach Simone Pianigiani uses in Olimpia Milano’s PNR offense. When executing a PNR, the ball handler should always keep in mind the option to reject the PNR. This takes advantage of the defense preparing for the expected ball screen and using their coverage against them. It is one of the easiest ways to get a drive and kick opportunity, as well as draw some extra fouls. Holding the screen is a tactic which Olimpia Milano uses when opponents’ bigs play a “Drop” coverage in PNR. When Olimpia Milano’s bigs hold a screen for one more second than usual, it creates space and time for the ball handler to make a decision. If the big defender continue the drop, ball handler is completely open for a 3pt or midrange shot. If the defending big switches onto the ball handler, it is immediately a mismatch situation. Snake is also a common tactic to attack non-aggressive PNR defenses, like Flat or Drop. In my opinion, Olympia Milano executes this concept better than any other team in the Euroleague. When Snake action is run properly, it will lead to a 2-on-1 advantage or a mismatch situation every time for the offense. Olimpia Milano faced some Ice PNR Defense on Side PNRs, however it has seen much success beating this type of defense. Every time when opponents try to “Ice” Side PNRs, OM bigs change the angle of the screen. The ball handler dribbles out to create time and space, and then attacks the rim line, which immediately creates some good looks. 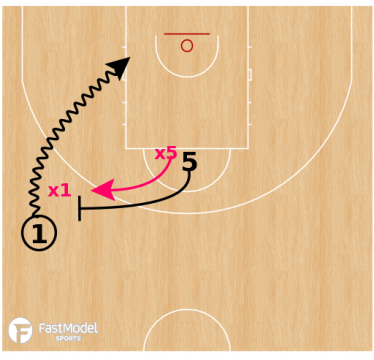 If the defense’s big tries to play an aggressive PNR coverage like “Aggressive Step-Out/Hedge,” the guards of Olimpia Milano immediately try to split the hedge, which often ends with drawing a foul or forcing help and rotation. After a PNR, if there is no pass to the roller or a drive to the basket, the screener’s defender starts to recover his position. Thus, this becomes a great opportunity to seal or screen him. 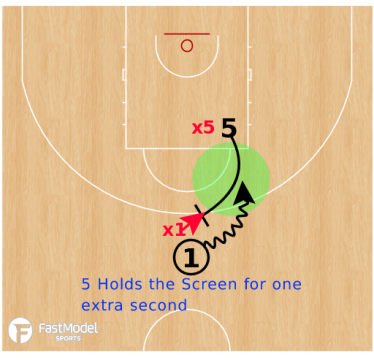 When 5 makes this paint clearout, the ball handler will have a large open space to finish at the basket, as the diagram below shows. A pocket pass is a bounce pass between two defenders. As Ettore Messina, assistant coach of the San Antonio Spurs, once said: “The pocket pass is the most important pass in the basketball.” Personally, I completely agree with him. 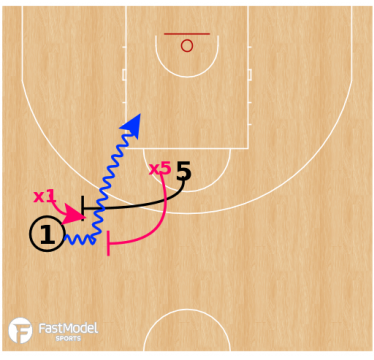 Pocket passes are the most reliable way to play a 2-on-1 advantage, which has been created after PNR actions because the nature and trajectory of the pocket pass is very low, making it difficult to steal this type of pass. When the defense starts to help on the roller and then rotate, Olimpia Milano will execute passes to weak side very well. Look at the execution of passes in these diagrams. No straight passes at the hands level of the defense. In next video, there are examples of passes when a ball handler looks at one point and then quickly execute pass to the weak side. The defense cannot react on time due to the deception of the ball handler. A hook pass is one more way to deliver a ball to the weak side. The biggest advantage of this pass is that the ball handler does not pick up the ball with both hands. Instead, he passes it quickly with one hand before the defender can react quick enough to lift his hands up to steal or tip the pass. We don’t see too often this pass, but this also an effective way to deliver the ball to the weak side. When ball handler starts to shoot the ball, usually everybody on the court watches for the ball in the air or starts boxing out a defender. To execute this pass properly, everyone on offense have to wait for this kind of passes, as you see below. A delay pass is a high-level pass which Olimpia Milano executes when opponents play a Hedging defense on PNRs. When the screener’s defender steps out to hedge, the ball handler dribbles out away from the hedge to release pressure. In that moment, x5 starts to run back to 5, so x5 can’t see the ball. Here is exactly the moment when the offense gets a 2-on-1 advantage, because x2 (low man) has to play in between 2 and 5. Check out the perfect timing by Olimpia Milan in this final video clip.